When using the DL1 mk2 to log data from the SPEEDBOX, the DL1 mk2 must be configured to store incoming serial data and not its own internal data to memory card, and not to output serial data itself. Step-by-step instructions to achieve this are given below. Note: These instructions apply to connecting a SPEEDBOX and DL1 mk2 only; if you wish to connect a SPEEDBOX, DL1 mk2 and a DASH then please contact Race Technology for advice. 1. Open the DL1 mk1 and mk2 configuration tool. 2. Click on the �Update rates� tab. It is necessary to ensure that �Incoming serial data� is enabled to be stored to the memory card. Additionally, all variables that are to be taken from the SPEEDBOX must be disabled from being stored to the memory card, to ensure that they don�t mask the data from the SPEEDBOX. Typically this will be the GPS receiver data and the acceleration and gyro values, and possibly analogue 1 � 4. Figure 1 below shows incoming serial data only stored to memory card, with all internal variable storage disabled. 3. It is also necessary to disable serial output on the serial port, to prevent a feedback loop between the DL1 and the SPEEDBOX. To do this disable all of the variables (including incoming serial data) in the �Serial Port� column. Note that there may be some circumstances where this is not desirable, such as if a DASH is also connected, in which case this step may be omitted as long as the SPEEDBOX has definitely been configured NOT to pass through RT format serial messages. 4. Next click on the �serial port configuration� tab. 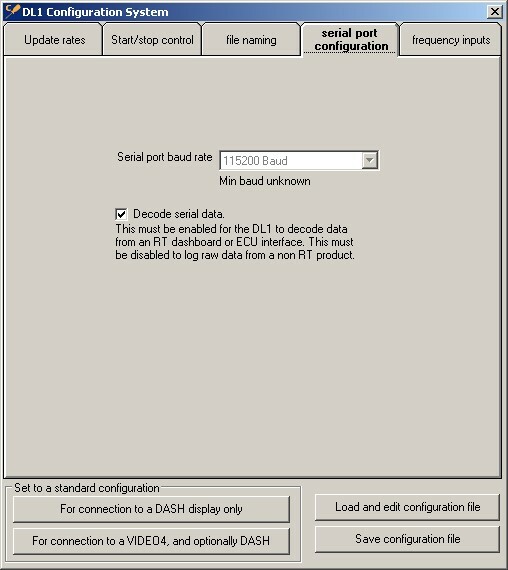 Ensure that the box labelled �Decode serial data� is ticked, and that the baud rate is set to 115200 baud. 5. Finally, remember save the new configuration and load it to the DL1 mk2! Once both the SPEEDBOX and the DL1 mk2 have been configured to work together, please connect them and test your logging setup to verify that the required data is being recorded prior to using it for testing.